Great players have great skill. They are simply very smart, gifted game players. Every world-class player I have ever met is an extremely intelligent person, and most have proven so with success in other areas outside of backgammon. Many are world-class poker, Scrabble, bridge, gin rummy, and chess players. Many have been extremely successful in business or sports or have proven to be gifted writers. But across the board, they all have a very high level of intelligence. Great players have studied the game. I don't care how smart or naturally gifted they are, in order to be a expert level player there are some concepts and strategies that simply must simply be studied and memorized. Great players have a huge library, in their head, of reference positions. Having such a library requires not only an excellent memory, but first they must have spent time looking at key positions and committing them to memory. In this article, I will attempt to give you some insights into the importance and use of key reference positions. Let's start with an example. In the position below, Black is obviously a huge favorite to win the game. The question is, what percentage of the time does Black win the game and win a gammon? It is important to know these numbers, because this kind of position comes up often, and knowing how likely you are to get a win or gammon helps you determine how much risk you should take in bearing off your checkers. Now, a very gifted player might be able to reason through the possibilities and odds and come up with an estimate, but virtually all top players already know about what the odds are in this position. And they know it because they have taken the time to study positions like this and they know it is an important enough and common enough situation that is worth committing to memory. With the base reference point, you don't have to memorize every possible position; you can simply make some intelligent guesses and adjustments. As it happens, if you move those spares from the 6, 5, and 4 to the 1, 2, and 3 the gammon odds go down to just under 2 percent. Why is it so important to know these percentages? First, they help you relative to cube decisions. You immediately know that with one checker closed out you are not likely to ever be too good to double, and you immediately know that if you are doubled, it's a big drop. Knowing this also helps you before you get to this position. If you are Black and gammons are critical because of the particular score and/or cube location, you might take a few more chances to hit another checker and try to close out two of White's checkers. By the way, another classic reference position is the same as above but with two of White's checkers on the bar, and there you generally win gammons about 40% of the time (depending on exactly where White's other checkers are). To further illustrate the importance of reference positions, here's another one I find interesting. Experts immediately recognize this position as a classic, well-timed back game for Black. As such they know that Black will win this game about half the time (in fact, Snowie gives Black about a 5% edge in wins on this game if White is on roll). But they also know Black gets gammoned about 1/3 of the time. I don't know how anyone, no matter how smart and how skilled, could come up with reasonable estimates of these numbers unless they access their memoriesunless they remember this, or very similar positions they have checked on one of the computer programs (Snowie, GnuBG and Jellyfish) to see what the rollouts and analyses say. It is in their memory as a reference position. And as such they can apply the knowledge over the board to help them make decisions relative to cube and checker play, whether they are White or Black. At certain match scores, this is a double for White, and at others, it would be foolish to double. At some match scores this is an easy take for Black, and at others, it is a big drop. And for money games, because White wins less than half the games, it's not a double even with all the gammons he would win. So my message to you all is, since you can't increase your I.Q. and innate game-playing skills, if you want to get better at backgammon, you need to study, and you need to make it a point to memorize and remember key reference positions. The more of those you have, the better you will be. But let me end this article with classic proof of this theory. One of the top players (and writers) in the game is a good friend and mentor of mine, Jake Jacobs. Anyone who knows Jake is well aware of his high intellect, but is perhaps more amazed by his memory. For some reason, and I do believe it is related to both I.Q. and good luck (genes), Jake has an amazing memory for just about everything. I mention Jake as living proof of the importance of studying, and remembering positions. 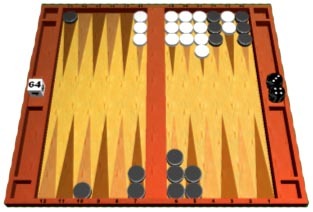 Jake has consistently been ranked one of the Giant 32 Players of Backgammon (a voting by the players) for many years. 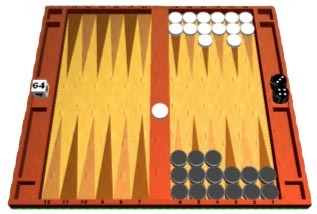 I'm a decent player, and I've played the game about 45 years and studied it seriously for about 20, and I would estimate that I have around 50 or 60 good reference positions. These are positions that come up often where I generally know about what the win/loss/gammon numbers are and also what the general strategy is for that given position. I would say Jake is about 5 times better than me, and probably has about 10 times as many reference positions. I have discussed hundreds of positions, with many of the top players in the game, and I have found, across the board, they are all able to estimate percentages for most positions very quickly, and they are able to do this because they are simply calculating the differences in the given position from a known reference position. They are rarely estimating or calculating from scratch. Most of us will never make that Giant 32 list, but even if you hope to make it to the top of your local club, or your little group, one of the major keys to the game is reference positions. If you see an interesting position, put it in one of the computer programs, see what it says, and make it a point to try to remember the numbers associated with the position. Whatever the level of your play, I promise you, the more reference positions you have, the better you will play.